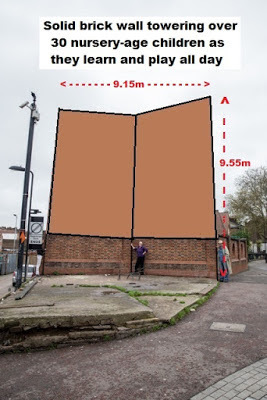 Eastern Curve Garden new big bad neighbour - tell Hackney what you think before its too late. 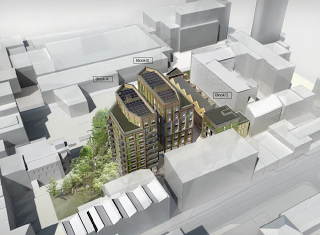 Darkness will descend across Dalston's Eastern Curve Garden if Hackney grants planning permission for a 9 storey re-development of the neigbouring Thames House site, behind Dalston Lane's Premier Inn, at 4 Hartwell Street. 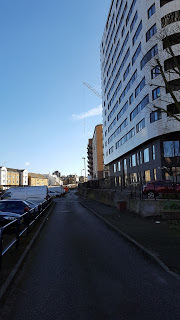 The two nine storey blocks will extend like a cliff along the Curve Garden's southern boundary and are predicted to obstruct most of its existing morning and afternoon sunlight. 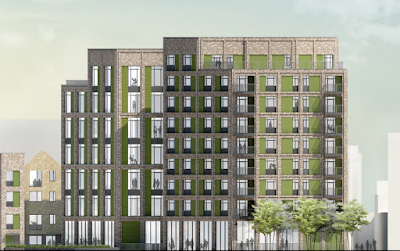 The designs have been under discussion for several years and Hackney's planners are now likely to recommend approval of the planning application. Although the Garden's sunny aspect will be permanently damaged, the developer will argue that, because 78% of the Garden will still receive at least 2 hours daily sunlight on average over the year, the Building Research Establishment (BRE) minimum sunlight guideline for open space is met. 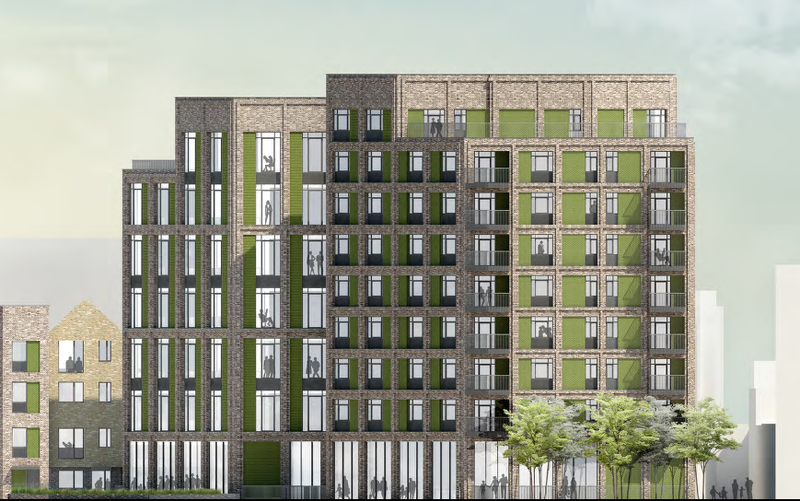 The development will exceed the Dalston Area Action Plan's maximum height and the blocks are stacked up so tightly into the site that, in the low rise block with family homes, 48% of the bedrooms and 25% of the living rooms fail to meet the BRE minimum guidelines for natural light. This indicates overdevelopment of the site. No sunlight report has been produced on the open spaces on the site itself which are also likely to be overshadowed, cold and damp. In other respects Hackney have insisted that the development should meet policy requirements - for example the site is within the local employment priority area and 4,209sqm (51%) will be for office space (Although only 10% of it will be "affordable". Ed.) and, of the 39 new flats, 8 flats will be for "affordable" sale and 12 for "affordable" rent ( But probably not affordable to local residents on average incomes. Ed.). The architects have also sought to respond to the extended conservation area by using decorative features like green glazed and stock brick cladding and decorative metal panels (But will those designs actually appear on the finished buildings? Ed.). The Garden is presently designated as a temporary amenity with future use of its land for a pedestrian "shopping circuit" along the Eastern Curve linking Dalston Lane with a planned redevelopment of Kingsland Shopping Centre. You can read OPEN's objections to the Thames House scheme here. You can make your views known to Hackney here. (Numbers count so even a short objection can make a difference. Ed.). 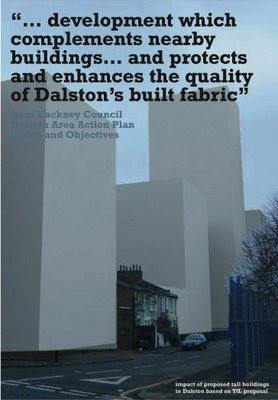 You can see the planning application documents here. The public consultation officially closes on 26th April, so don't delay, although the planners must report all public comments received to Hackney's planning committee prior to it making a decision. 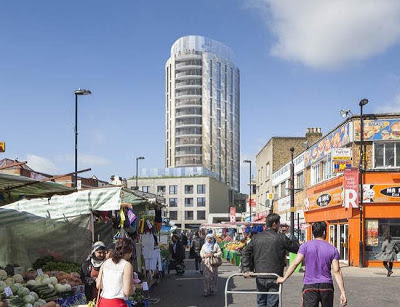 In the wake of hundreds of community objections, Hackney Council has announced that it has "clarified" its proposals for development of the Dalston Cultural Quarter. 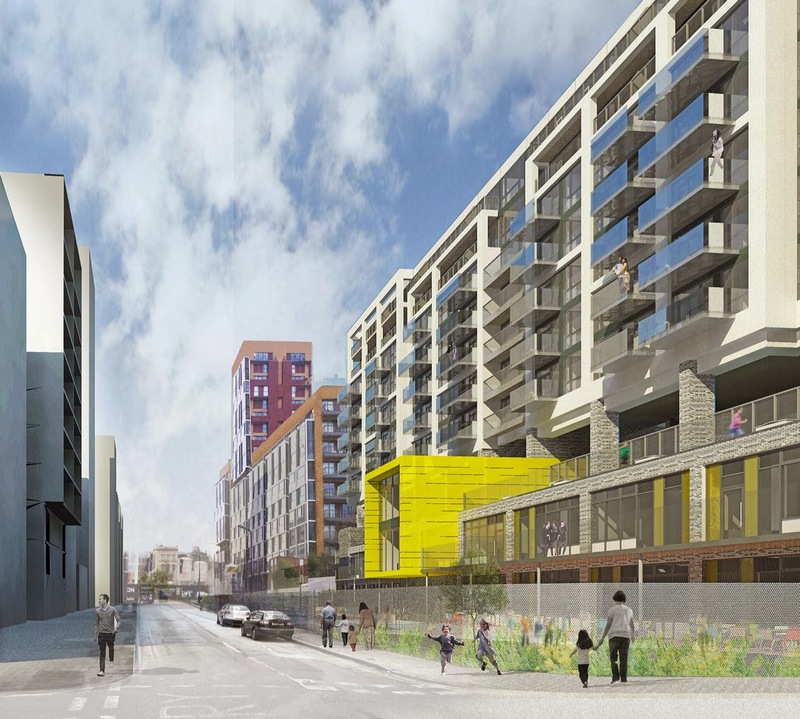 Hackney has also advised that the public consultation period has been extended from 17th until 30th April and that there will be a further public consultation before any developers' brief for its four Dalston sites is finalised. So well done Dalston for speaking up! (And thanks Hackney for listening! Ed). Karina Townsend's short film "Fanfare for the Curved Garden" featuring last Sunday's performance with Jaime Lucy's "Rucksack Cinema" projections and Andy Diagram's trumpet soundscapes. 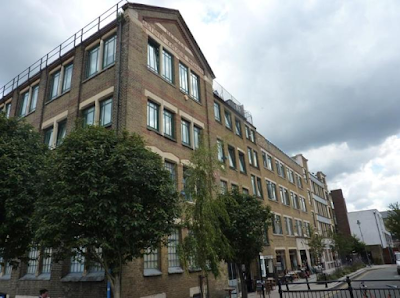 Dalston's Cultural Quarter keeps regenerating itself! The first of Hackney's corrections relates to the Eastern Curve Garden. The Council had refused to consult locals about the future of the Garden, although it is included in development Site 3. It had stated "The Garden isn't included in the consultation". 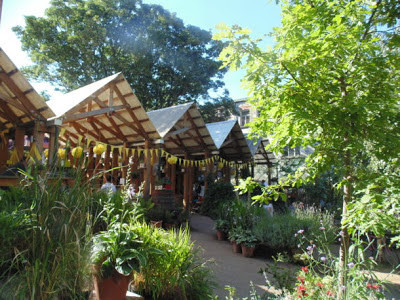 But now Hackney has shown the Garden on its consultation map and it states on line "the Council is open to exploring the potential to retain a community garden". This means that the Council will now actually consider the flood of representations that are being made urging Hackney to keep the Garden. So, if you haven't yet told Hackney what you think, do so before 30 April. The second major correction relates to its misleading description of the heritage value of 10-16 Ashwin Street. 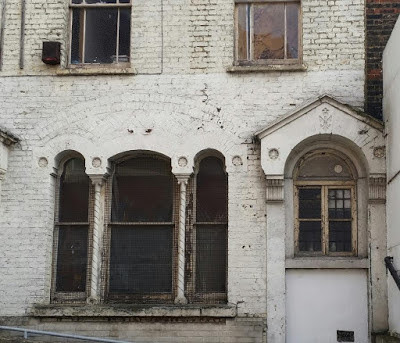 It had previously stated "The frontage of Nos 10-16 Ashwin Street is of historical value whilst the blocks to the rear are of LOWER historical value". This gave the impression that demolition of the rear would not be significant. 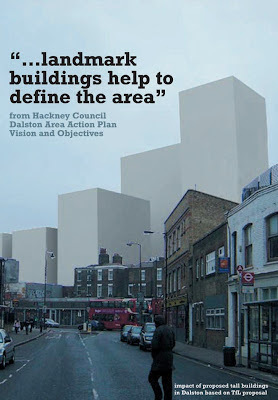 Hackney has now acknowledged that this contradicted the independent heritage advice it had received. It has now stated on line "the front and rear of No. 10 - 16 Ashwin Street is of HIGH historical value". 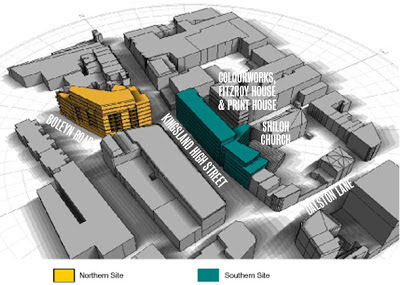 These developments don't necessarily mean that our Garden and heritage buildings will be saved. (But it's a good start! Ed.). It is still very important that people continue to make their views known. 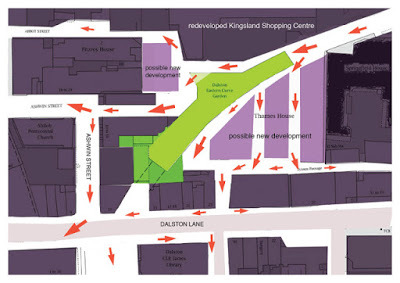 You can read OPEN Dalston's analysis and responses to Hackney's Cultural Quarter plans here. We hope that these will help inform your views and responses to the Council. 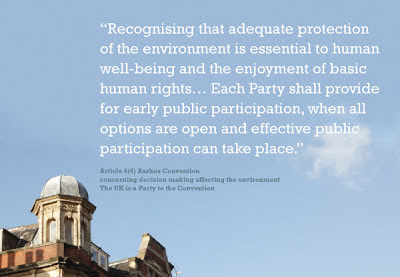 The public consultation now closes on 30th April. You can tell the Council your views here.